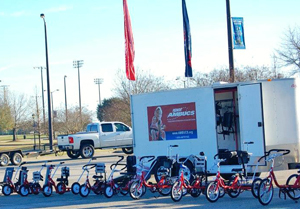 We will bring a trailer-full of trykes & adaptations to you! While visiting, we can present an In-Service training session for your professional staff and, if you would like, a Bike Evaluation Day where we help you fit your clients to the best riding solution for them. We would love to show you how to bring an effective bike program to your fair city! There is no cost for a Road Show visit but our calendar fills up fast. So schedule yours today. 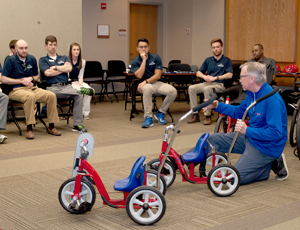 During the In-Service Training, physical therapists / occupational therapists / interested community members are shown the latest trykes and adaptations in the Amtryke line. They learn about the Amtryke assessment form and evaluation process. The Road Show Captain will review scholarly efficacy studies and tell you how to bring an Amtryke program to your fair city. This generally takes only 60-90 minutes. You may even be able to organize CE credit for the class. Check on the regulations in your state. 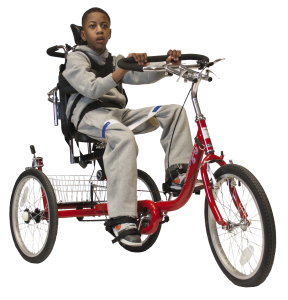 At an Amtryke Bike Day gives those who just took the In-Service Training hands on experience fitting children, adults or veterans to the best riding solution. The Road Show Captain will be there to answer your questions and help with any particularly difficult fittings. 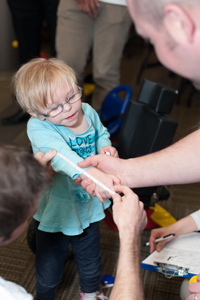 We will ask you divide the number of participating therapists by 2 or 3 to determine how many riders you can schedule per half an hour time slot. That way your fledgling fitters aren’t overwhelmed and can consult together in teams of 2 or 3 to determine the best riding solution (teams can be up to 5 therapists if you have a very large group). Scheduling time slots also helps cut down wait time for riders. If you are fitting children, please make the kids in the same time slot different ages—to ensure tryke availability. The Amtryke representative will act as a coach and mechanic, answering questions and helping with the bikes. Unless your group has a funding stream, all the riders fitted will go on the Wish List to wait for funding for their Amtryke. For this reason we limit the number of riders fitted at a Road Show to 10 or fewer. As the Road Show host, you choose who to invite. Some choose to only invite other clinicians at their facility while others invite other facilities and interested community members to participate. What are you on the hook for? You only need to provide enough room for the people you invite to be present. The visit can be outside or inside, at a clinic or community center—just keep in mind the length of the training and the comfort of your riders. The Captain will need enough room for at least 5 trykes and several totes of adaptive accessories. One common weekday scenario is scheduling the In-Service from 3:30 – 5 pm and then scheduling the evaluations from 5 – 7:30 pm. But we can certainly hold it earlier in the day or on a weekend, when the Road Show calendar allows. We don’t need a podium, mic, or media. We do have a nice PowerPoint we can present if that’s easy for you. But if not, that’s no problem. We do need a place to park a full sized truck pulling a 15 foot trailer. It would be very nice if some volunteers would help unload the trailer 15-30 minutes before the start of the training and, afterwards, help bring everything back out to the trailer. Some hosts choose to provide refreshments for their attendees, but that’s up to you. You can also choose to invite local media. Files below are customizable Microsoft Word Documents. Each have editable text boxes to add your event information. How to: click the link below, Save As to your computer, update the template for your purpose and save. Please note: The lighter colored background images will print in full-color.